The Sportsman’s Charity Dinner 2018 raised over £60,000. This allowed us to support both our featured charities, Trust Rugby International and My Names'5 Doddie Foundation along with many other charities such as Disabled Curlers Scotland, Teenage Cancer Trust, Cystic Fibrosis Holiday Fund, North Edinburgh Dementia Care, What? Why? Children in Hospital, The Hearts and Balls Charitable Trust, Tweedstart and Edinburgh BATS. Reports from some of the charities about what they did with the support they received will be included in our 2018 Dinner Programme. Supported by Scottish Rugby, Trust Rugby International (tri), which was founded in 2010, is a proactive, Scottish based charity, whose goal is to bring individuals and communities together through the game of rugby. Unlike other organisations, who use the non-contact version of the sport to involve people with learning disabilities, tri believe all players can be enabled to participate to their full potential and have already established several fully unified, full contact rugby teams. We have all heard the devastating news of Doddie’s Motor Neurone Disease diagnosis. Doddie has created his Foundation to help fund research into this debilitating disease. “My Names'5 Doddie Foundation" will work with the Euan MacDonald Centre at Edinburgh University where the aim is to slow, stop and ultimately reverse its devastating effects. Both these charities work tirelessly to provide services for the young and the not so young ensuring that they achieve and live life to the full. As has always been the Charity’s policy, other smaller charities operating in the areas of sport, children, the disabled and the disadvantaged will also receive support. In order to try and surpass last year’s dinner where Brian Blessed kept us entertained for the evening we have lined up a formidable team of speakers with an appropriate rugby theme. Our Master of Ceremonies this year is the broadcaster John Inverdale who will host the evening and our auctioneer will be Willie Hunter. Costs involved in hosting the dinner are significant and to raise as much funding for our nominated charities as possible we do rely on the generosity of our sponsors who help us mitigate the costs of the speakers. 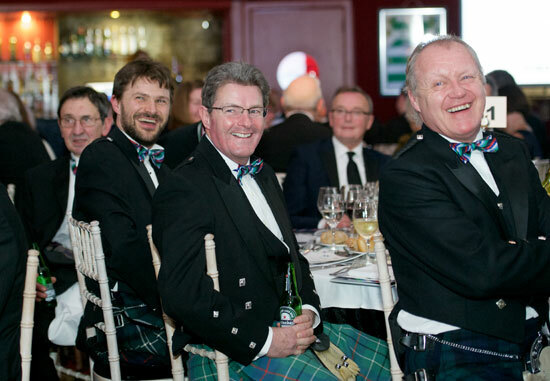 The 2018 Dinner will provide a fantastic start to the Scotland v England rugby weekend, at Murrayfield and a great opportunity to entertain clients and friends with a table at the dinner.